Howdy all. One day closer to the weekend and for a change, a day even more closer towards The Arsenal playing, which is nice methinks. The manager did his press conference yesterday and spoke about the injury to Bellerin, he spoke about United and also on transfers. There’s not much point in me going over the Bellerin stuff I don’t think as I’ve pretty much said all I can say on that and other than to reiterate what a massive blow it is to us, him and the club, all we can do is hope he returns back fighting for for next season. What this season has showed is that we need him in the team because our other options aren’t as good as him. The United thoughts were fairly benign as you’d expect, but he acknowledged that it would be a different performance to the game last year and earlier in the season. United looked a confidence-shorn team and now they look like they have a swagger about them after seven wins on the bounce. It means this is a tough game we have ahead of us but we had an unbeaten run stopped in its tracks by Southampton of all teams, so I don’t think we should be too concerned with the fact that they’re on such a great winning run. Form out the window, big game, etc, etc, blah, blah. Unai did also reserve some praise for Koscielny after his performance against Chelski and if we’re talking about confidence and how important that can be for our opponents, we shouldn’t underestimate the value of that win against Chelski and some of the individual performances. Koscielny was ace that day and it feels like that was a performance the player needed. We know he can’t probably can’t play two or three times a week any more but that he put in such a performance at a time in which Unai is flitting between a back four and back five is important. It gives the manager options, something which long term injuries this season have taken away from him, I feel. 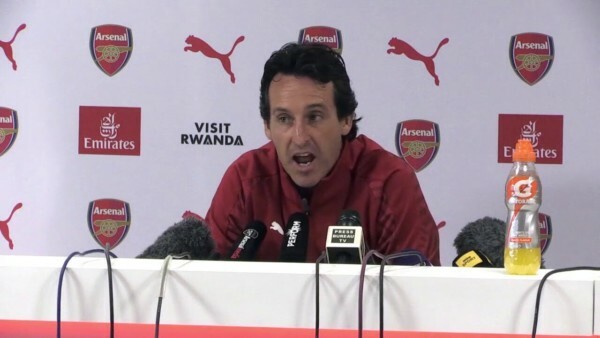 Signings are inevitably discussed at these press conferences and in a bit of a contrast to his “only loan deals” comment a couple of weeks ago, Unai stuck to a more fan-favourable comment of “we want a defender and a wide player before the window closes” in yesterday’s presser. Makes sense. It’s also probably what we need and although it will probably only be a loan deal, at least we know the club are working on stuff and at least we know that they won’t be bullied in to signings like Suarez on a compulsory loan agreement. He could potentially be a good addition but it represents a gamble and so Arsenal’s decision to stand firm against Barcelona is a welcome one from me and a lot of Gooners I reckon. I also saw the Eric Bailly rumours and whilst it’s a signing I’d probably say would be good for us, I could understand why United have laughed a little at us. We wouldn’t sell them our third or fourth choice centre half so why would they sell us theirs? It only takes a couple of injuries and whilst Mustafi’s erratic nature is infuriating to some people, if you asked them honestly right now if they’d want him in the squad or just booted out with no replacement, I’m sure most fans would want him sticking around. Finally, a word on Monchi, who is at Roma but of course has a good working relationship with Emery from Sevilla and has also been quite as saying he’s ‘flattered’ to be linked. I think it was Tim Stillman that made a bit of a flippant remark over the fact that modern football now has back room staff playing the same PR games as players play. Despite what he said as being a little tongue in cheek, it does ring true and is funny that 20 years ago nobody knew the name of backroom staff, yet today because of the publicity and impact of mediums like social media, stars are being made without having to even grace the football pitch! That’s because it’s all about those ‘marginal gains’ and stealing a march on competitors. If you can find a scout who has a keener eye on finding young talent than anyone else, getting him can be the difference between a Torreira or a Denilson. So perhaps the thinking is similar with regards to a technical director at the club? Perhaps getting one of the most well known guys in that position – in replacement for losing Sven – is something they want to consider? It’s all speculation at this stage anyway and until anything hits up we should just focus on the football in front of us. And that’s a game against United in the cup tomorrow under the lights.